This week, Dispatches from the Field is thrilled to welcome Dr. Bob Montgomerie as our guest blogger. Dr. Montgomerie is a professor at Queen’s University, and his fieldwork has taken him on adventures all over the world. Below, he shares one of those adventures with us. I go into the field to do research for three different reasons. The first is, understandably, to collect data to test hypotheses that interest me. The second is to help graduate students and colleagues with their research, to widen my experience and help me better understand their findings. The third is just to get close to species that I have read about and to see them in action, in part so I can write with more authority about the published literature. This is a story about a close encounter of the third kind. 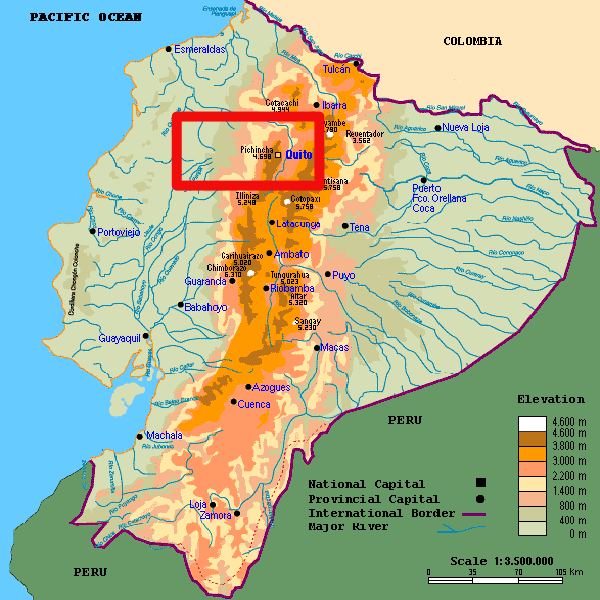 Map of Ecuador showing the area explored (red). I went to Ecuador in February to lecture to some Queen’s alumni on a Galápagos cruise. En route I went to the Andes for a few days before the cruise to work with a colleague, and to see some iconic Andean birds with unusual morphologies: Sword-billed Hummingbirds, Long-wattled Umbrellabirds, and Club-winged Manakins. My old friend Dave McDonald (Univ Wyoming) was in Ecuador on a year-long Fulbright Fellowship, and he generously offered to show us around. 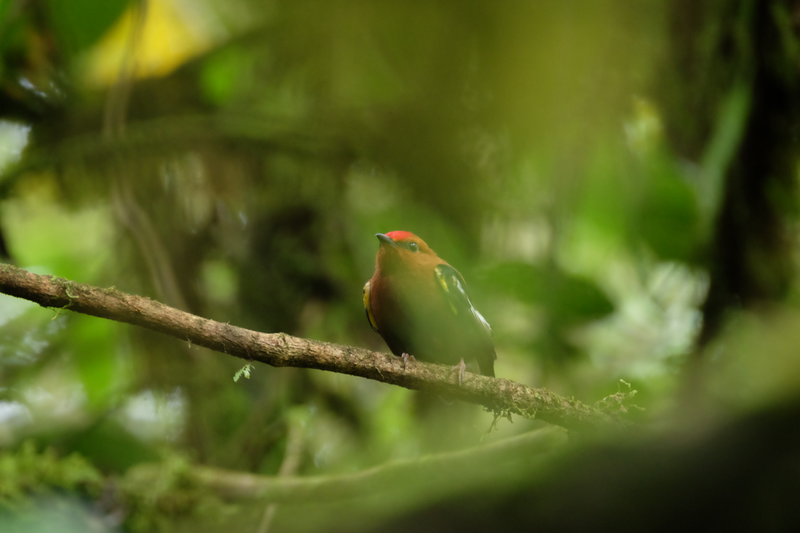 Dave is Dr Manakin, having done his PhD at the University of Arizona on Long-tailed Manakins and continued to study that group for his entire career. We began our trip with the (almost unbelievable) Sword-billed Hummingbird early the first morning at the Yanacocha Natural Reserve (altitude 3500 m) near Quito. On Charles Darwin’s birthday (12 Feb), we settled into the eponymous Mirador Río Blanco lodge, overlooking the valley of the Río Blanco below. From there, we would have easy access to both the hummingbird and the umbrellabird in the next couple of days. Río Blanco from the Mirador lodge. The next morning, we went to the Milpe Bird Sanctuary (1100 m) for the manakin. Dave and his students have been studying manakins here for years but it is also a great place to watch hummingbirds, which we did for most of the morning. Just as we finished lunch, Dave got a call from a friend to say that he was needed in Nanegalito, so he left for a few hours to deal with that, leaving us to find the manakins on our own. “It’s easy,” he said, “just go about 30 minutes down the trail and take the first side trail to the left, then down to the bottom of the hill and the birds will be somewhere near the first sharp corner.” Even if we failed he’d be back in time to show us the birds. And how could we possibly fail? My friend Tim and I had been studying birds in the field for more than a century in total. Our trek down the trail was magical with birds and anticipation. Just as we arrived at the spot that Dave had described, we heard the tell-tale tuk-tuk-zzzzing of the male’s display. This was the courtship display so beautifully described just a few years ago by Kim Boswick. Using high speed video she discovered that the males the zzzzing sound by rubbing their wing feathers together at more than 100 times a second. It is also the species that apparently revealed the secrets of sexual selection to Rick Prum (2017. The Evolution of Beauty. Yale Univ Press). At last we could witness this display first-hand…but where was the bird? Even though he tuk-tuk-zzzzinged every 30 seconds or so, and seemed to be less than 3 m away, we simply could not find him. Was the bird ventriloqual? Was he hiding in the dense foliage? And then, after 10 tantalizing minutes, he stopped. We had the same experience further down the trail, with probably another male. Frustrated by this little bird, and by Dave for not giving us better instruction, we decided to head back to the trail head to wait for Dr Manakin’s return. As we passed that first spot, we again heard a tuk-tuk-zzzzing on the other side of the trail and higher up—but the bird was still invisible. By triangulating we eventually found him high on a bare branch amidst the dense foliage about 10 metres away. He called a few more times then disappeared, only to return again every few minutes to resume his displays. Such fidelity to display sites is typical of lekking male birds. The elusive Club-winged Manakin on his display perch at Milpe. After taking a few photos, I went back to where we had first heard a male tuk-tuk-zzzzinging. As soon as I stepped off the trail into the dense underbrush, a female landed right in front of me, less than 2 metres away. Almost immediately she was joined by two males who both tuk-tuk-zzzzinged before they saw me and spooked, disappearing into the forest. When we returned to the trailhead, Dave was there, smiling when we told him our story. I think he knew that finding elusive species on your own is way more exciting than being shown by experts. Long before daybreak on the last day a local guide showed us the umbrellabird near a town called ’23 de Junio’ (about 1000 m), halfway down the western slope of the Andes. The males of this species also lek, but they were relatively inactive that morning and visible only through a telescope in the dense early morning fog. We had achieved all of our goals, but the manakin was the most memorable, in part because it was the hardest work. This week, Dispatches is very excited to welcome back guest poster Becky Taylor – who has become Dr. Taylor since we last heard from her. Becky shares with us a true story of surviving a full-fledged fieldwork catastrophe with nothing more than determination and a lot of kindness from strangers. For more about Becky, check out her bio at the end of the post. It’s funny how some moments are forever fixed in your mind’s eye, like a snapshot that you can recall in absolute detail. I am standing on a beach at 4 o’clock in the morning, marooned on an uninhabited desert islet in Cape Verde (off the coast of western Africa), with two other people and no possessions but the clothes on our backs (and a bottle of Cape Verde wine), gazing at the carnage that was our campsite. How, you may ask, did I find myself in this situation? 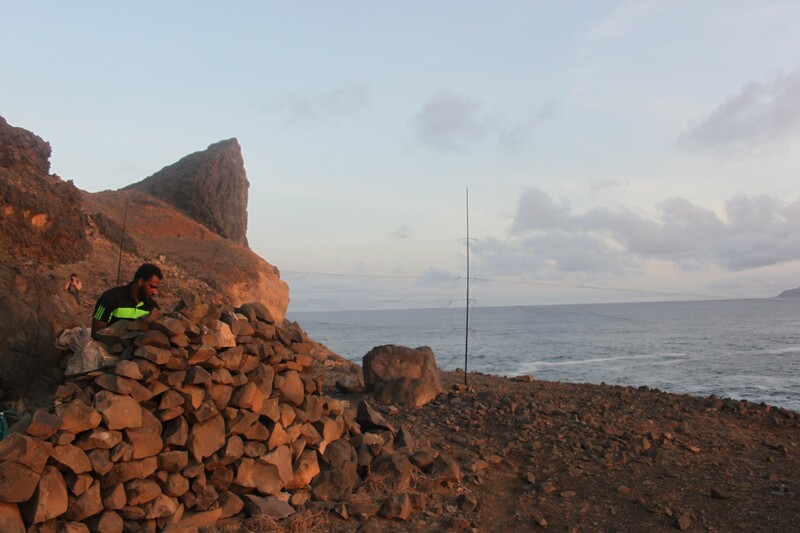 The isolated beaches of Cape Verde are a beautiful place to work…and a frightening place to be marooned. I don’t want this post to be in any way negative about Cape Verde itself. Quite the contrary. It is by far one of the most beautiful and incredible countries I have ever been to, and the sheer kindness of the people who live there was not only welcoming from the minute I arrived, but a life saver when things didn’t go to plan. They have a saying in Cape Verde: ‘Morabeza’! From what I understand, it translates as ‘treat guests exactly as family’…and that is exactly what they did. 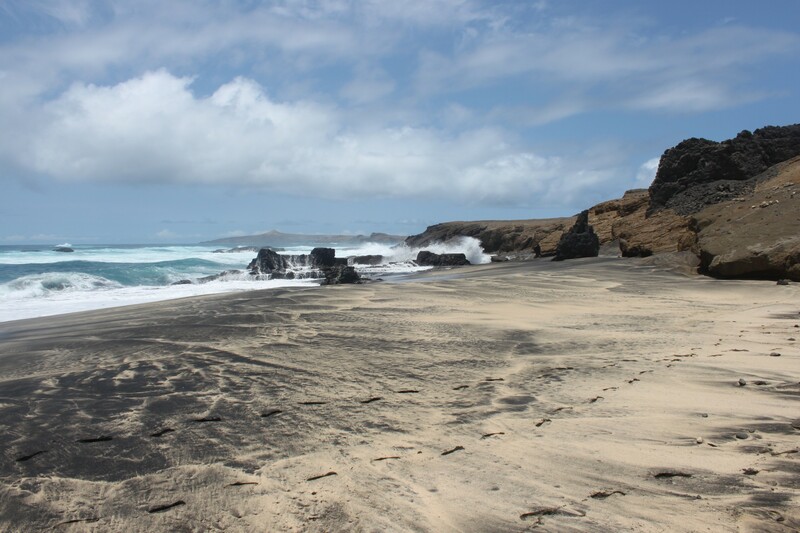 I travelled to Cape Verde during my Ph.D., for which I was studying genomic variation in band-rumped storm-petrels. These are small, nocturnal seabirds that breed on remote islands, and a population of particular interest to me lives on some of the small islets in Cape Verde. I travelled first to Fogo Island, one of the bigger inhabited islands, to plan for field work and meet up with my wonderful field leader, Herculano, the manager of Parque Natural de Fogo. 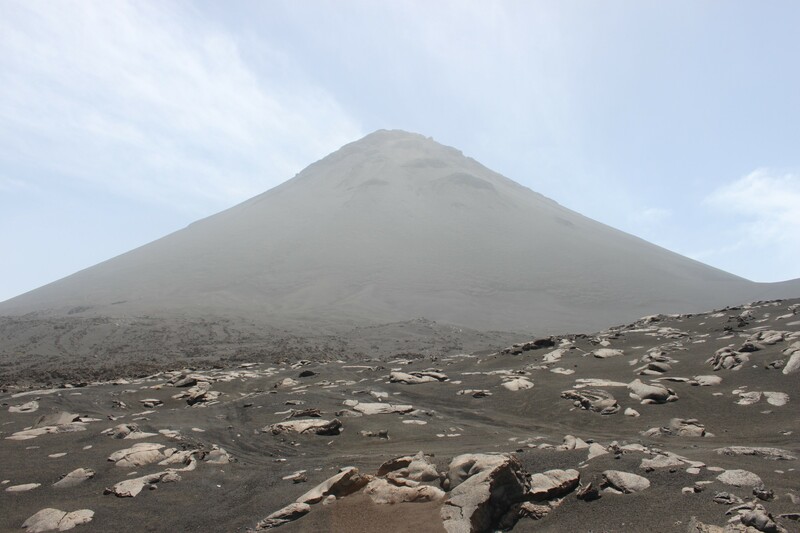 While we were planning our work, Herculano took me to Pico do Fogo, the active volcano that gives the island its name. It is an area of stunning beauty, and I had the opportunity to hike on the lava field and go caving through lava flow tunnels. While on Fogo, I also swam in a beautiful lagoon, enjoyed the soft black sand beaches, sampled wine in the local winery, and ate fried eel (which is actually very good)! There are few tourists who visit Fogo island, and it really is one of the world’s best kept secrets!! Our campsite home on Ilheu de Cima. After sightseeing and gathering supplies, it was time to start fieldwork! We needed to catch storm-petrels on a small islet called Ilheu de Cima. As Cima is nothing but rock and a string of beaches, we had to bring all of our supplies with us, including food and water. Herculano arranged for some local fisherman to drop the three of us (himself, my field assistant and childhood bestie Freyja, and me) off on Cima with our camping supplies. And for the first few days we enjoyed our own little island paradise. By day we would explore the small islet, trying to find some shelter from the sun, although shade was very hard to come by. Luckily I like hot weather, so I was thoroughly enjoying the heat and our many private beaches. All ready for action: Freyja and Herculano with our mist net. As the storm-petrels are nocturnal, we would hike to the nesting colony before sunset, scramble down a rock face on the far side of the 1km islet, and set up our mist net to catch birds as they flew to and from their rock crevice nests. Usually we would catch birds until around 3 or 4 o’clock in the morning before packing up and hiking back to camp. As it was September we were fortunate enough to be there during the loggerhead sea turtle nesting season, and we (very quietly) would watch females lay their eggs as we wound down from our work! It all sounds amazing, right? Too good to be true, I suppose. One night, after a really great night of sampling, we hiked back to camp to find….well…no camp. And that brings us to the point at which I started my story. We stood on the beach realizing that our entire camp was gone (aside from that one bottle of wine, which had somehow survived). We can’t be 100% sure what happened, but it looked like a big wave came in and washed everything out to sea. 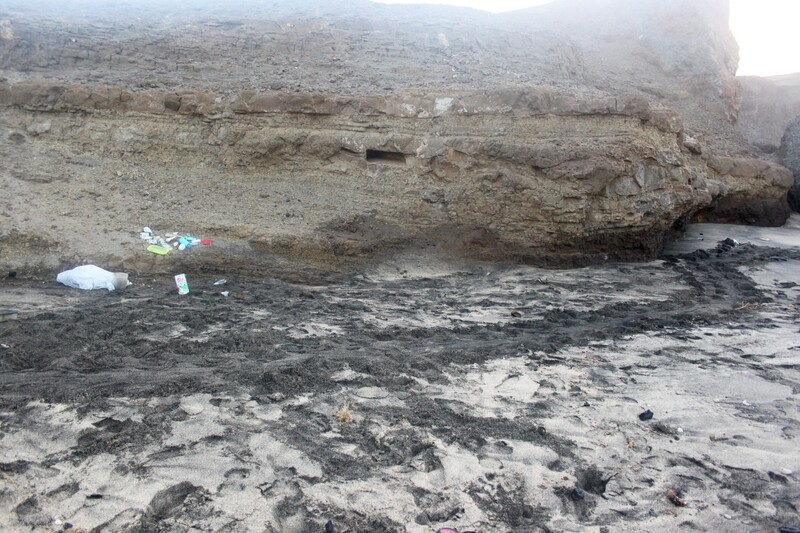 Bits of debris were scattered across the beach, and our tents (which we had anchored with boulders) were gone – along with everything that was inside. 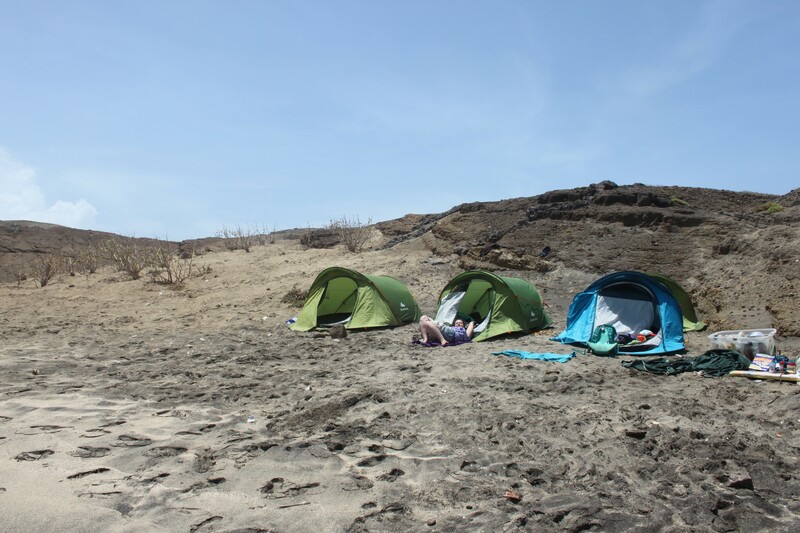 And obviously when you are camping on an uninhabited islet, there is no one to steal your possessions, and so you don’t mind leaving everything in your tent. For example, your passport, money, bank cards, and ID’s. Damn. So what do you do in that moment? 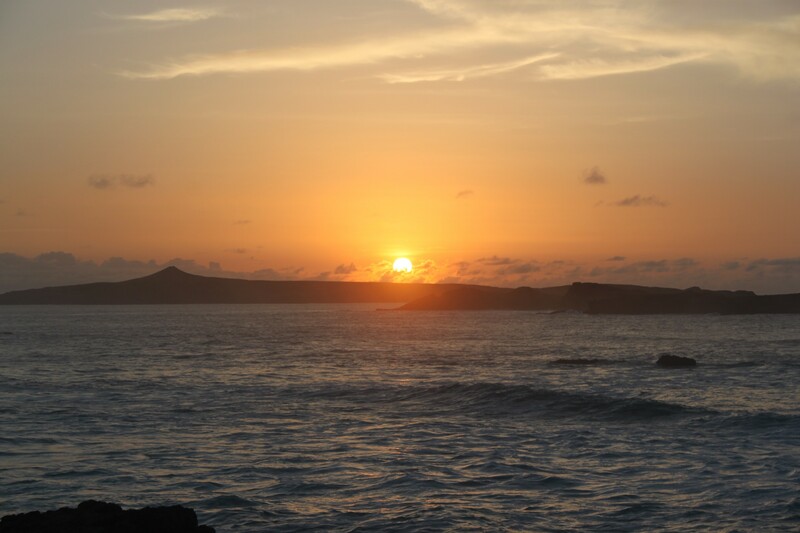 Well, we sat on top of the islet, watched one of the most beautiful sunrises I have ever seen, and swigged from the wine bottle, feeling defeated. Thankfully we had kept our phones on us and so could call for help. Eventually, we managed to get hold of the fisherman, who rescued us that afternoon. Back on Fogo, Freyja and I realised we were now in a foreign country with no way of accessing money or identifying ourselves. We relied on the kindness of Herculano, his family, and the other locals, to provide food and shelter (and some spare clothes). Without their help I don’t know what we would have done. It was a big learning experience for me, accepting so much from people I hardly knew. Morabeza indeed! Freyja and I are both British citizens, but there is no British consulate in Cape Verde, so the British consulate communicated with the Portuguese consulate to provide us with temporary travel documents. Eventually, with the concerted efforts of a whole host of people, we managed to arrange our way back home. (It took a few days, though, by which point we were looking particularly haggard). At the time I was pretty traumatised, feeling like the whole experience had been a complete disaster. However, looking back I learnt a lot from it. Possessions can be replaced; the fact that we were safe was all that really mattered. And I will never be too proud to accept help when I need it. I don’t regret my time on Cima: it was a unique experience and a wonderful place to have spent some time (not to mention a great story). Plus, the samples we had collected that night were still in my bag, and thankfully provided enough material for me to sequence the storm-petrels’ DNA and finish my research project! 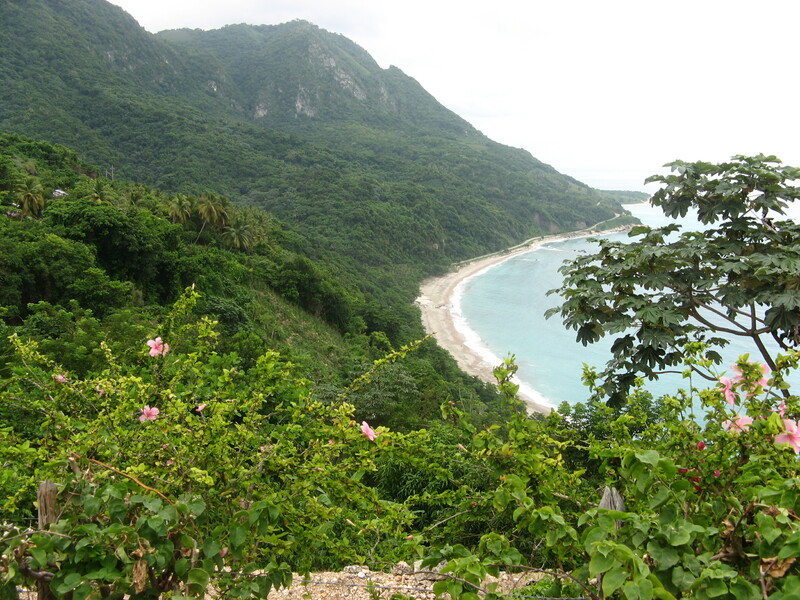 Cima has a unique combination of both black and white sand beaches. The wind mixes the two together in some places to create beautiful marbled beaches. I would like to dedicate this story to Herculano, Emily, Bianca, and the rest of their family for their help and kindness, to Freyja for being a great person to go through a disaster with, and to everyone who was involved in helping to find us money and a way home. 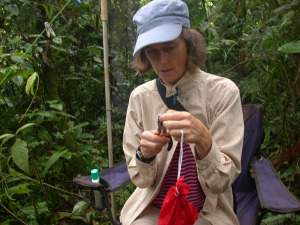 Dr. Becky Taylor completed her undergraduate degree in Biology at the University of Bristol, after which she spent two years as a researcher for the conservation charity Wildscreen. She then completed her Master’s degree in Evolutionary and Behavioural Ecology at the University of Exeter. During her M.Sc. she became passionate about wildlife genetics as a tool to study evolutionary questions but also for conservation purposes. 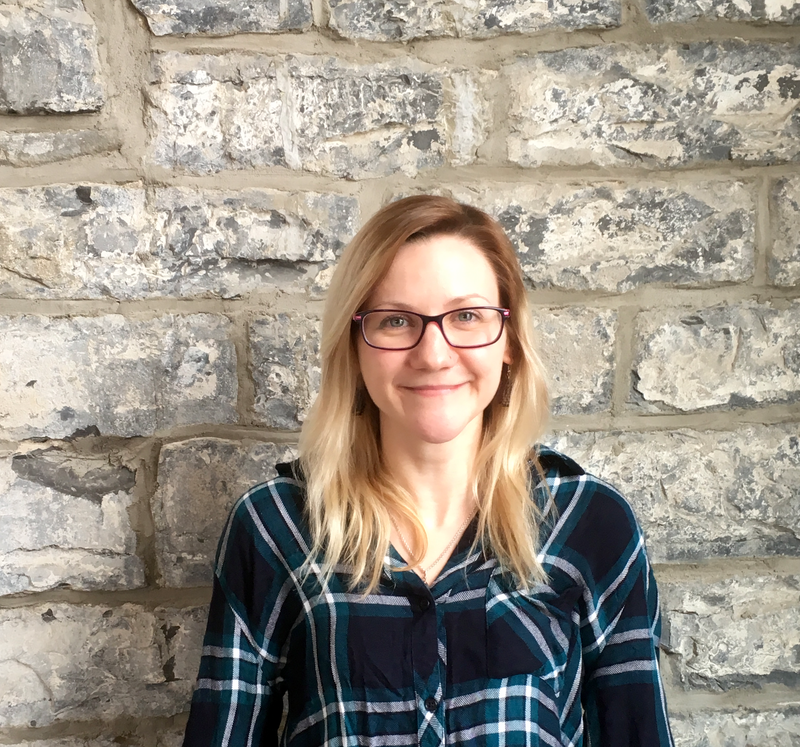 This led her to undertake her Ph.D. at Queen’s University in Ontario, studying genomic variation in the Leach’s and band-rumped storm-petrel species complexes. She completed her Ph.D. in 2017 and is currently a Post-Doctoral Fellow at Queen’s University, undertaking further work with the band-rumped storm-petrels and a few other wildlife genetics projects. You can follow her on Twitter at @BeckySTaylor. We are very excited to welcome Dr. Alice Boyle back as a guest poster today. In her previous post, Alice shared some of her adventures from her doctoral fieldwork in Central American, and this week she takes us back to the Caribbean slopes of Costa Rica. For more about Alice, check out her bio at the end of the post. 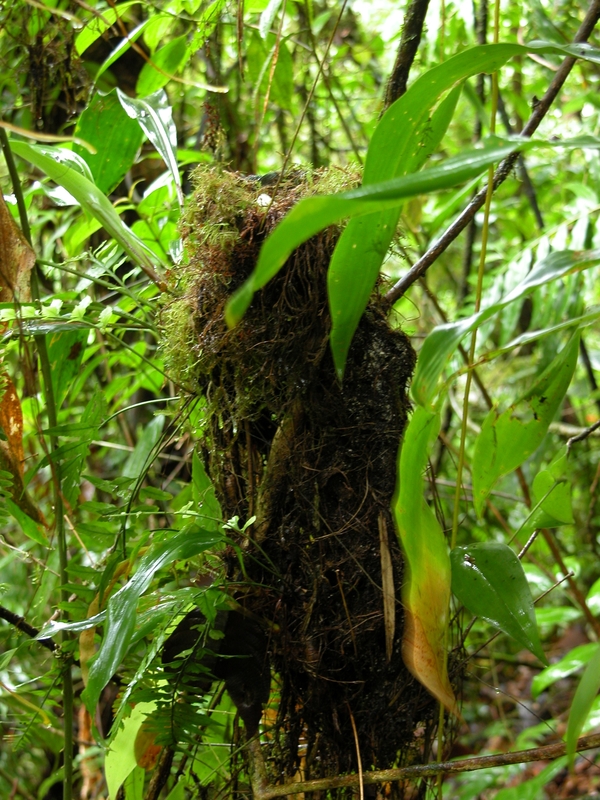 In 2004, I spent a year doing field work on the wet, Caribbean slope of Costa Rica. It was the 4th and final field season of my dissertation studying altitudinal bird migration. 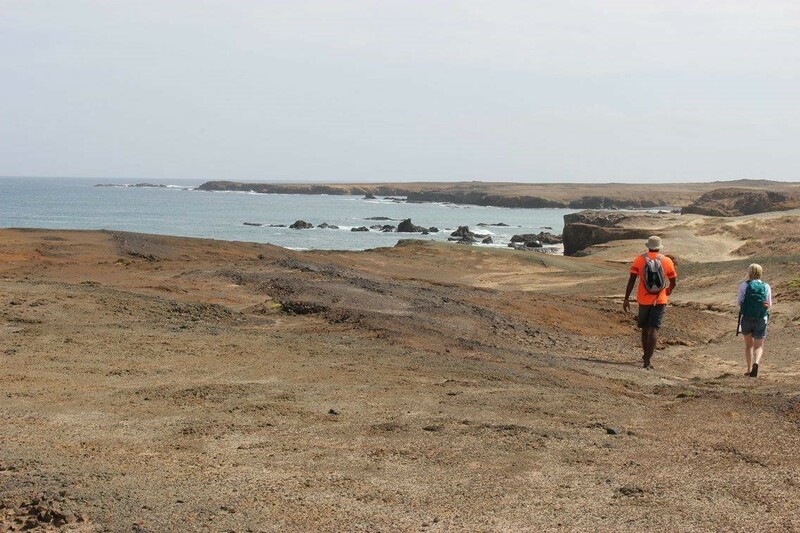 Each month we would work very hard for 23 days, and then my assistants visited beaches and volcanos, while I prepared for the next round of sampling. I also wrote letters to my family during those breaks, and my father urged me to publish them. A while back, I posted excerpts from the April letter. Here, I continue that story with an account of the crazy first week of May as we initiated a nest predation experiment across at 3000 m elevational gradient. When I last wrote I was just getting ready for the big “nest predation experiment” month. All was going smoothly until the very last minute. Three days before starting to place nests, I went to San Jose to pick up the car*, the last batch of canary eggs, 400 wicker nests, bags of moss, and other weird miscellaneous supplies (for example, tiny decorative ice-cube trays for transport of jelly-bean sized fragile canary eggs). My last stop was to get the baskets that would become “nests”, made to order by a Guatemalan artisan. When I arrived, the store owner started bringing out bundles of NOT the 8-cms diameter cup-shaped baskets I had ordered, but huge pigeon-nest-sized baskets! AGH! Four hundred useless wicker baskets… crisis! The poor owner of the basket store was almost as dismayed as I was. We tried modifying the baskets, savaging one with an exacto knife. It disintigrated into a sharp mess, and poor Emilia (the store owner… we were on a first-name basis by this point) got badly cut. Eventually, I realized there were three alternatives: 1) somehow find 400 smaller baskets elsewhere, 2) use some other cup-shaped product (…like a cup? ), and get really creative with paint and glued-on moss as to make them look as nest-like as possible, or 3) give up. Option 3 wasn’t really an option. I had way too much invested. Aside from hoarding canary eggs for over a month**, I’d found a cheap vehicle to rent, gotten extra permits, and had a friend flying in to fill in a 2-week personnel gap. Option 1 really seemed pretty unlikely too. It had taken 2.5 months to get these baskets, and I had only 3 days left to find replacements. After deciding I had little option but to look for some other cup-shaped object, Emilia appeared with a hopeful look, holding a different style of small basket. Not quite so perfectly nest-shaped as the ones I’d ordered, but small and definitely better than a plastic cup! She only had 149, but the maker lived in the Talamanca mountains in Costa Rica. He had a phone and answered her call. I only heard one side of the conversation: “you know those little baskets you make me? how many can you make by Monday? ………. and how many more by Thursday? ……….. well, how soon could make an extra 250 for me? ……… look, we have an EMERGENCY here! Can’t you HIRE someone to help you! ?……” And so we resolved the problem. They cost twice as much and I had to make 2 extra trips to San Jose to pick them up by installments, but it worked. This little glitch meant that our grueling itinerary now included late-night nest preparation before they could placed out in the forest… at 8 sites over a 3000 m elevational gradient. Unfortunately, the nest glitch wasn’t the only set-back. Three days later we started wiring fake nests into trees in the forest, each containing a real canary egg and matching plasticine egg***. As we left the La Selva lab the first morning, it started raining hard, and it didn’t stop for the next 8 days. 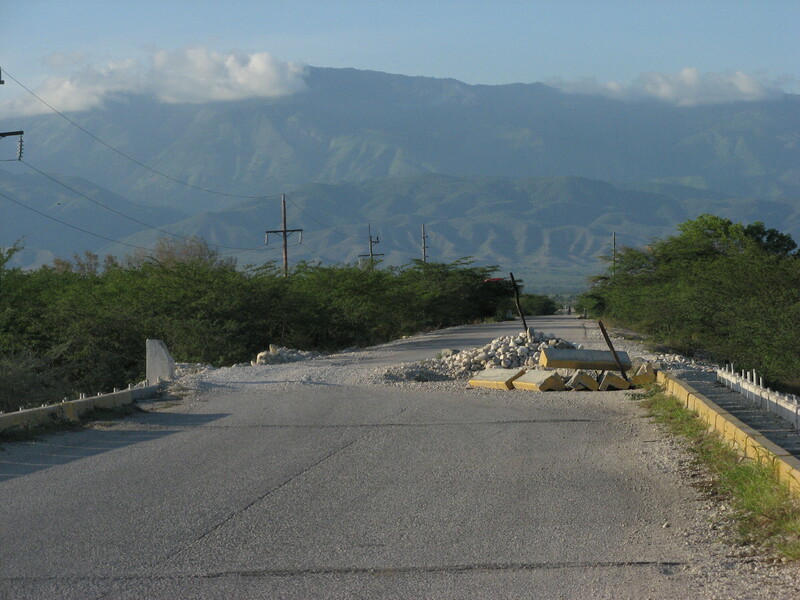 During that week, so much rain fell that a car was swept off the road and landslides closed the highway between San Jose and the Atlantic lowlands. All rivers were transformed into roiling muddy torrents and there was massive flooding. At La Selva, dorms were evacuated, access to the station was by boat, and the river reached its highest level since 1970. Meanwhile all the rain was falling on us. After the two lowland sites, we headed up to Rara Avis**** for the 650 m and 800 m sites, but our reservations at the station had been forgotten and the tractor (only transport option) wasn’t going to leave until late. That meant we got a day behind schedule, and I was starting to panic, until we took on ‘Crazy Mike’ as the 5th member of our team. Mike was a volunteer guide but didn’t get along with his new boss. When he heard about our nest, weather, and tractor-delay woes, he simply quit his guiding gig and came along for the adventure. Mike was a godsend! He rarely stopped joking and never let the rain get him down. True, he did also drink an incredible amount. But he was tireless in machete-ing his way along a compass bearings through treefalls and vine tangles. So we caught up, doing 2 sites in one brutal 13 hour field day. Next day we were back down on the tractor, and around to a different side of the park, back up the mountain to higher elevations. We got behind again because the nests weren’t ready, and now were working in cloud forest where the rain was distinctly chilly. Luckily we were able to spend a night in San Jose where we all got hot showers, ate pizza, and drank copious amounts of beer! Had we not had to prepare more nests after dinner it would have been a fun party. But the schedule was relentless. The next day we went to the highest site—2800 m near the peak of Volcan Barva. The drive was awful. With every bump in the road I thought we were going to destroy the suspension. With five of us, nests, spray paint, wet rain gear, half eaten food containers, muddy rubber boots, gross packs, and canary eggs, the Bronco was the definition of sordid. But we made it up, and comforted ourselves with strong liquor purchased in San José. The next morning there was a slight rain respite. Everyone got to see quetzals and I was feeling optimistic… the end was in sight. Only our last day and our last site remained. Getting there involved looping around Barva volcano on country roads, ending on a red dirt road leading to a little-used park access point. The drive was long, rainy, and very uncomfortable. We were exhausted. The little farmhouses seemed unoccupied near the end of the driveable road, so I continued farther than I should in hopes of finding a safe place to leave the full car. And then, I drove into a ditch. Yup, right into a deep ditch. The whole right side of the Bronco was SERIOUSLY stuck. I have been stuck enough times to know when it is serious. We had no shovel nor anything other than sticks and rocks to help us. After probably 1.5 hours, many failed strategies, and admirable teamwork, we got the Bronco out! But we had lost a lot of time, and when I made it clear we were still going to try to get into the site and get the last batch of nests placed, there was near mutiny. Obviously, no one wanted to do anything other than shower, do laundry, and collapse into a clean bed. It was now early afternoon and we had to walk over an hour to the forest. Eventually I decided to leave Mike with the car and get as many nests placed at this site as possible. Even if we didn’t get all 50, we wouldn’t lose a whole site. So we did it, and as we hiked out with the last light, the clouds finally parted and rain finally stopped. We had panoramic views of Poas volcano and the whole drenched Atlantic lowlands almost as far as the coast. NOW our woes were over, surely! The Bronco had one last devilish trick in store, however: loss of power brakes and a mysterious stalling problem. Somehow the strain of getting out of the ditch had caused new problems. Whenever I braked or changed gear, we stalled. For two dark, foggy hours on winding mountain roads, I was constantly stalling and roll starting, terrified of losing brakes entirely and peeling off the cliff into the abyss. The headlights pointed unhelpfully into space instead of illuminating the road. And as a last straw, the driver-side windshield wiper stopped working. We limped into Puerto Viejo, completely drained from stress and exhaustion. Fortunately, the pizza joint was open and had an ample supply of cold beer, despite the floods that cut off both water and sewage service. It wasn’t til 9:30 that we finally found our beds at La Selva. 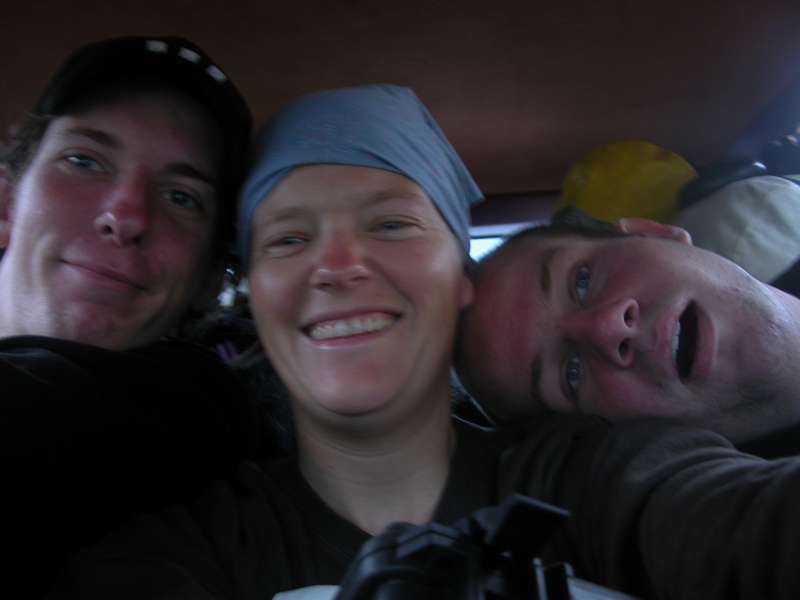 That week was, without doubt, the most stressful and dangerous week of field work in my life. It was crazy and hectic the whole rest of the month, as part of the crew rechecked all the nests in sequence repeatedly over subsequent weeks, while others continued our monthly bird and plant sampling. 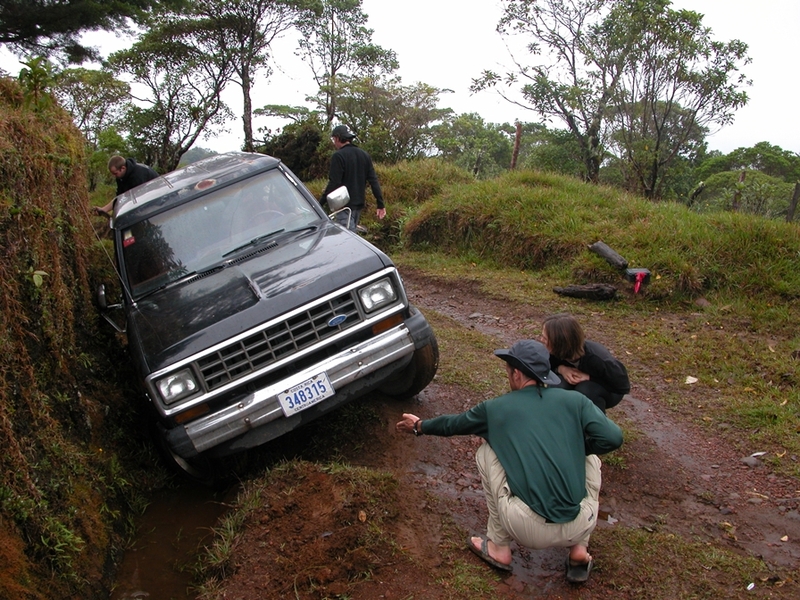 But thankfully, fieldwork has never been quite that crazy since. It is good to know what you can tolerate. And it is good to remember the hardship, when, during long days in front of my computer, fieldwork seems to become a romantic memory. Yes, being in the field work is amazingly fun and rewarding, but it also stretches you to the max, testing your ingenuity, tolerance for discomfort, ability to remain cheerful, and to make really hard decisions that often seem to pit personal safety against scientific discovery. * I had an incredibly tight budget! My entire PhD was completed on funding from small grants, so there was no way to get a commercial car rental. Fortunately, I found an old 4×4 Bronco to rent for cheap from a friend who was thinking of getting rid of it. **** Rara Avis was the mid-elevation field site where I did a lot of my PhD research. Alice Boyle is now an Assistant Professor in the Division of Biology at Kansas State University. She continues to study the evolutionary ecology of tropical birds, but has also fallen in love with the tall grass prairies surrounding her new home. Consequently, she has been chasing Grasshopper Sparrows for the past few years and learning just how different prairie ecosystems are from tropical wet forests. This week, Dispatches from the Field is excited to welcome guest blogger Zachary Kahn, who tells us about some of the trials, tribulations, and triumphs of his fieldwork in Costa Rica. For more about Zach, check out his bio at the end of the post. I was surprised the first time it happened, although I really shouldn’t have been. I had been warned many times. I had been told to wear bug spray and bring tape, but that it was inevitable. Still, I couldn’t help but feel a little shocked to see hundreds of tiny poppy seed-like critters crawling all over my body. Indeed, I had been “tick-balled”, a term referring to having an army of tiny ticks latch onto your clothing and spread across your body like a group of crazed protesters. The trick was to make a ring of duct tape, with the sticky surface facing outwards, and peel them off. Sadly, I didn’t have any tape that day. This was the first of many times I would be tick-balled, and my first introduction to one of the many joys of doing tropical fieldwork in Costa Rica. I am currently a Masters student at the University of Windsor, and my research is focussed on the behavioural ecology of tropical songbirds. Why study birds in the tropics, you ask? Well, unlike in the temperate zone where it is primarily males that sing, often both males and females sing in the tropics, and sometimes combine their songs into cool vocal displays called duets by overlapping or alternating their songs. 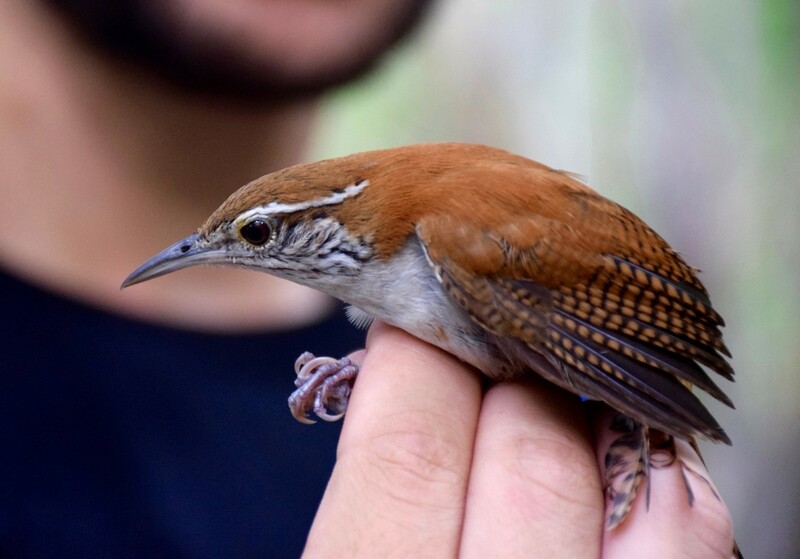 I became interested in studying the reasons birds in the tropics sing duets, and I have tried to do this this by studying a population of Rufous-and-white Wrens in Santa Rosa National Park, in northwestern Costa Rica. I have spent the past two field seasons in the tropical dry forests of Santa Rosa romping around and chasing birds like a crazy person, all the while getting tick-balled and falling down more times than I’d like to admit. My study species: the Rufous-and-white Wren (Thryophilus rufalbus). Isn’t he pretty? My day in the field is pretty similar to any other field ornithologist. I get up super early to record birds while they are singing, set up mist nets to catch and band birds for identification, and closely monitor their behaviour. I also need to check inside their nests in order to assess what breeding stage (i.e. eggs or nestlings, and how many) each pair is at throughout the field season. For many species, this is fairly straightforward. You find the nest, make a note of its location, look inside, and you’re done! Finding the nest is usually the most difficult part since many species have mastered the art of nest concealment and camouflage. 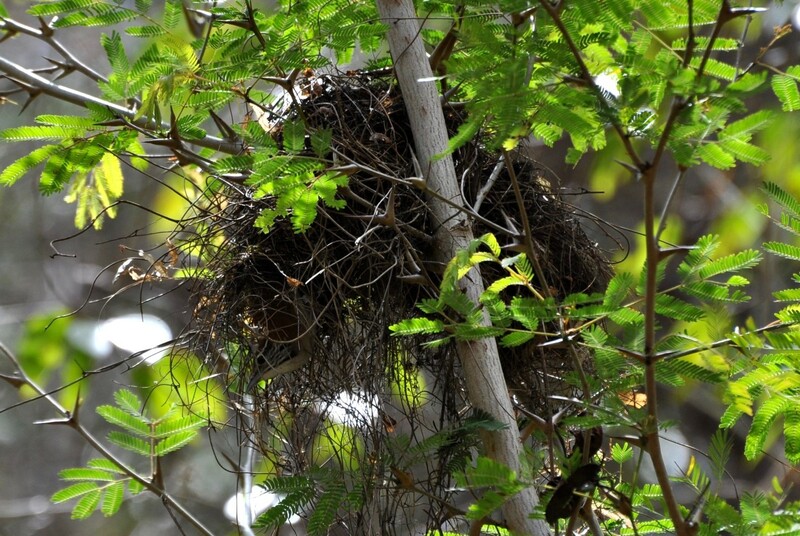 A Rufous-and-white Wren nest in a Bullhorn Acacia Tree (Vachellia cornigera). If you look closely, you can see some ants along the main stem, and a wren getting ready to leave the nest. Luckily for me, I don’t have this problem. Rufous-and-white Wrens nest in Bulhorn Acacia trees over 80% of the time at my study site. Their nests are bulky conspicuous globs, and there are very few acacia trees in the forest, making it relatively easy for me to find their nests. Simple, right? Wrong. The funny thing about acacia trees is that ants like them too. In fact, many species of ants have a symbiosis with the trees: the tree provides the ants with food and shelter in return for defense from predators, other plants, and stupid field biologists. To get inside the wren nests, I have to use a ladder, open a hole in the back of the nest (they are enclosed domed structures instead of open cups), feel inside, then sew the nest back up, all while being bitten by a swarm of angry acacia ants and nearly falling off the ladder. My hands swell up like balloons every time I have to do this, giving me yet another visual reminder of the joys of tropical field work. 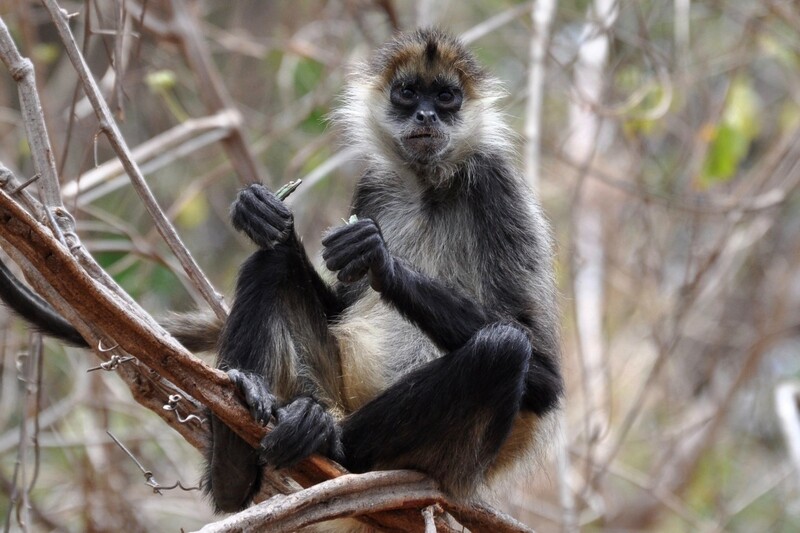 A Black-handed Spider Monkey (Ateles geoffroyi) snacking on a seed pod in Santa Rosa National Park. I don’t mean to imply that all of my experiences in the tropics have been bad because overall it really has been amazing. I have been fortunate enough to see an incredible assortment of bird species, such as the Elegant Trogan, Blue-crowned Motmot, Keel-billed Toucan, and Long-tailed Manakin. And it’s not just birds. There are monkeys too. Yes, they throw sticks at you and sometimes try to pee on you (one missed me by about a foot last summer), but getting to watch them move through the trees each morning is more than worth it. It’s also really cool seeing different species of snakes (including some that are extremely venomous), frogs, lizards, and mammals like Tamanduas, Coatis, and Agoutis. We even saw a Tapir this summer! Having the opportunity to see so many cool animals on a daily basis is really awesome, and by far my favourite part of doing fieldwork in the tropics. 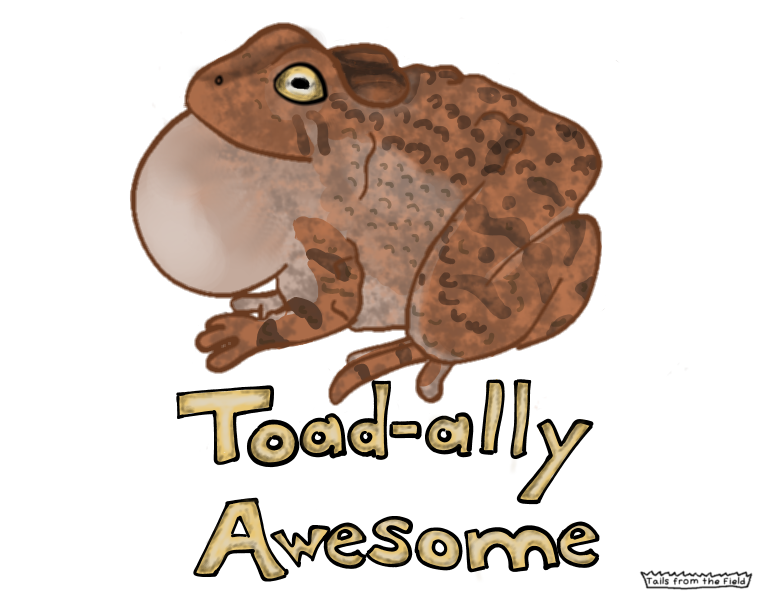 Perhaps the most incredible thing I have experienced during my time in Costa Rica is what my lab refers to as “Toad Day”. Once a year, for only 1-2 days after the first large rainfall of the year in May, huge numbers of frogs and toads congregate at previously dried-out ponds and rivers in the park as they begin to fill up with water. Hundreds of them come to the water and begin to chorus together in order to attract females to come and breed. Many species do this, including Cane Toads, Mexican Burrowing Toads, and several species of tree frogs, but the most interesting of them all is the Yellow Toad. For most of the year, males and females of this species look like your typical run-of-the mill toads, mostly brown in colour with the occasional splotch of grey or rufous. However, as soon as it starts to rain in early to mid-May, the males turn a spectacular lemon-yellow as they congregate at the breeding pools. This transformation corresponds with intense competition for females, and aggressive fights between 2,3,4 or more toads for a single female are common to see. This sight – hundreds of bright yellow toads and other species chorusing together all in one place – is one of the most incredible things I have ever seen, and is something I look forward to every time I go back to the field. 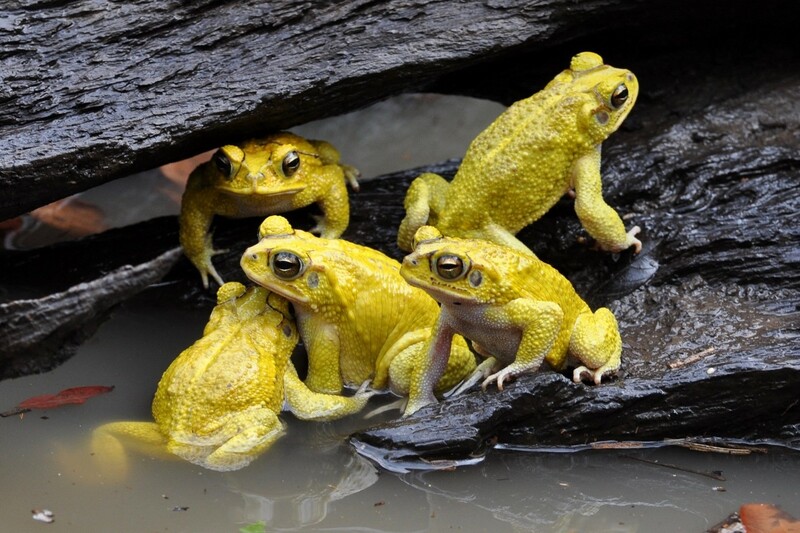 A group of male Yellow Toads (Incilius luetkenii) at a breeding pond in Santa Rosa National Park. Anyone who has done field work knows it can be a rollercoaster of highs and lows, an endless series of amazing experiences and unique challenges. This is especially true in the tropics. On one hand, there are tick balls, venomous snakes, valleys of slippery boulders, and hordes of biting ants to deal with. On the other, there are amazing animals to see, scenic beaches to swim at, and daily exposure to unique tropical ecology. I have had a blast over the past two field seasons in Costa Rica, and I would highly recommend that others go down and do fieldwork in the tropics if they get the chance! 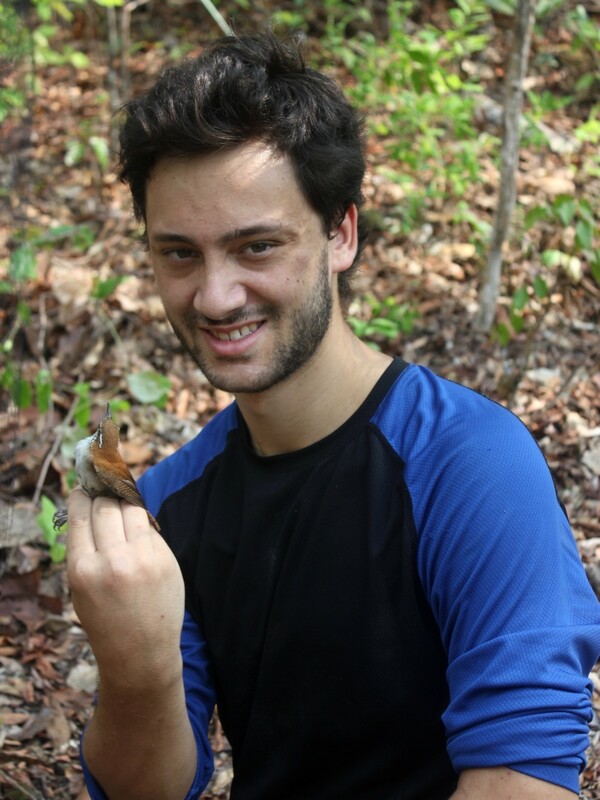 Zach Kahn is a 2nd year Masters student in Dan Mennill’s bioacoustics lab at the University of Windsor, studying the behavioural ecology of tropical wrens in Costa Rica. He completed his undergraduate degree in 2015 at Queens University, where he studied interspecific competition in closely-related songbirds for his Honours thesis project under Paul Martin. He is passionate about wildlife ecology, natural history, and conservation, as well as being outdoors and playing softball and football. 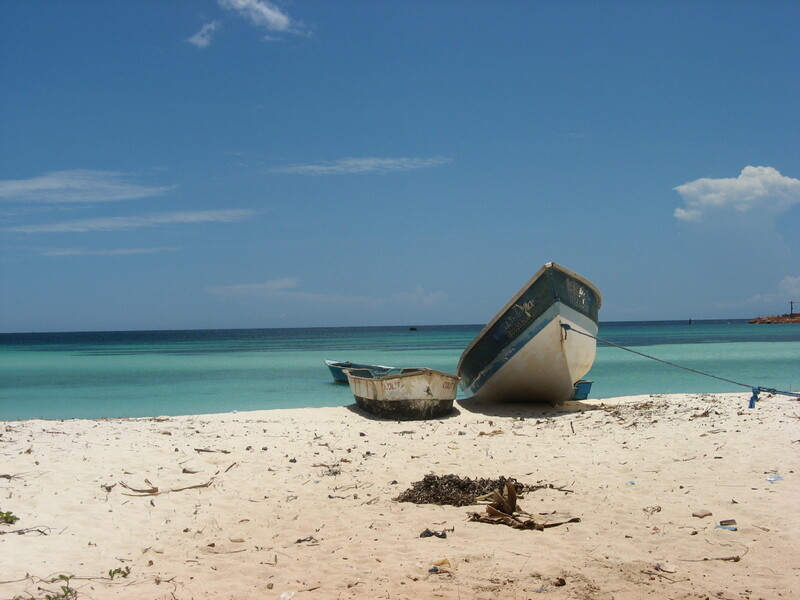 A boat, a blue ocean, and a beautiful day: can you think of a better goal than that? This question at least partly guided my MSc research, leading to a project involving fieldwork on Nova Scotia’s iconic Sable Island. In fact, by the time I finished my MSc, I’d been lucky enough to do fieldwork in some pretty fantastic places, from Sable to Alaska. 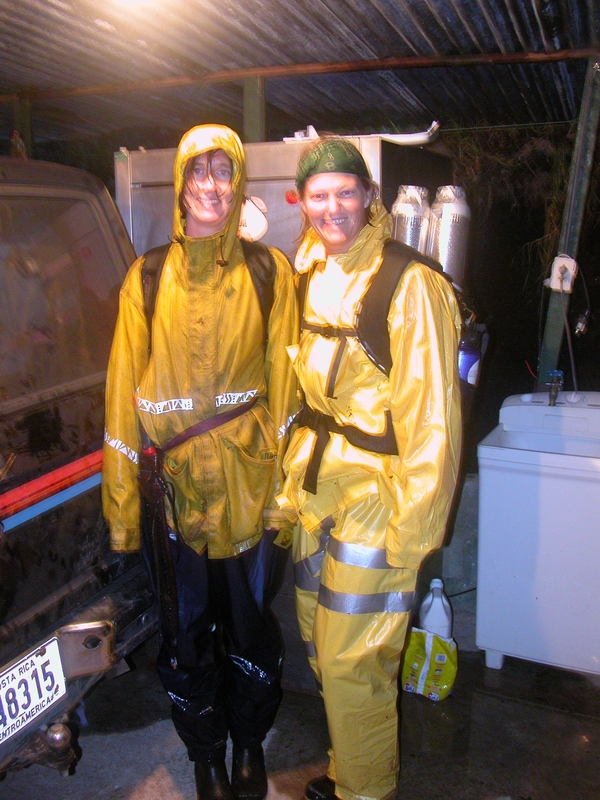 However, as I prepared to begin my PhD, I noticed a major gap in my experience: I’d never done tropical fieldwork. And from everything I’d heard, that was an experience well worth having. Anyone who’s ever taken a biology class has probably heard the term “biodiversity hotspots” used to describe latitudes around the equator. Well, after spending a few summers freezing in the fog of Sable Island, I was ready to try something different, and a hotspot of any kind sounded pretty good to me. Thus, when I started my PhD at Queen’s, I knew where I wanted to go, if not what I wanted to study: I was determined to develop a project that would allow me to do fieldwork somewhere tropical. However, I’d learned more than one lesson during my MSc degree – and so I was also determined not to repeat some of the more egregious mistakes I’d made. Unfortunately, it turned out that these two goals were somewhat incompatible. The second most important lesson I had learned during my MSc is that you can make your life a lot easier by working on a ‘lab’ study system – that is, one that has had the kinks worked out of it by earlier generations of grad students. Using a lab study system gives you access to well established methods and sites, other people who know and understand your system, and, often, years worth of previously collected data. However, despite the availability of two amazing study systems in the lab I joined at Queen’s, I was less than a week into my PhD when I decided that I wasn’t interested in either of those systems: instead, I was going to strike out on my own. How quickly we forget. In fact, for my PhD study system, I decided to go a step farther: instead of just picking a system that no one in my lab studied, I decided to go for broke and choose a study system that pretty much no one in the world studied. I knew from the outset that I wanted to study partial migration – that is, the odd (although not uncommon) situation where some birds in a population migrate, while others do not. I set about finding a study system that would allow me to pursue the questions I wanted to answer…but also finally do some tropical fieldwork. 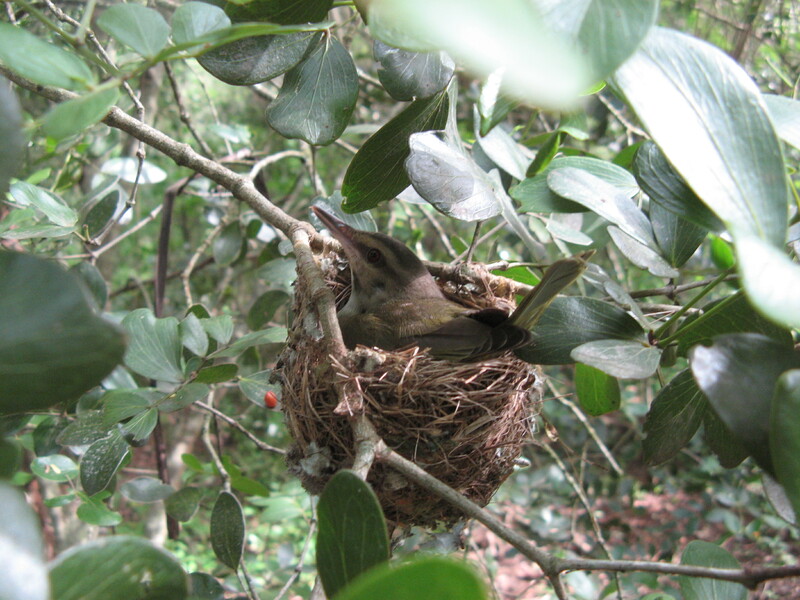 Female black-whiskered vireo sitting on her nest. Black-whiskered vireos seemed to fit the bill perfectly: distributed mainly throughout the Caribbean into South America, they display variable migratory behaviour throughout their range. I started digging through the literature, trying to find out what we already knew about the species and who had figured it out. It turned out that what we knew was slightly more than nothing – and those few facts had been figured out by a Canadian researcher affiliated with an institution not too far from mine. Excited, I immediately sat down to send him an e-mail. I received a response the next day – telling me that the researcher I was trying to get in touch with had passed away the day before I sent my e-mail. It was hard not to feel that that might be a bad omen. However, I remained determined. I knew what I wanted to study – now I just had to figure out where to go. Through an amazing stroke of luck, I connected with Kate Wallace, who runs an ecotourism company (Tody Tours) in the Dominican Republic. 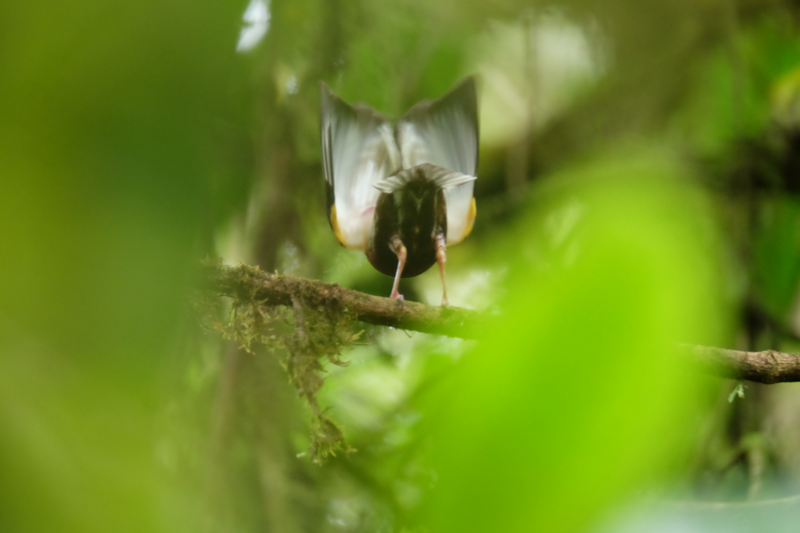 Kate had a small camp deep in the Sierra de Bahoruco, a mountain range in the far southwestern end of the country – and she was eager to host scientists wanting to learn more about the Dominican’s chronically understudied avian species. Now I had one study site – but I also wanted to be able to compare the Dominican partially migratory vireos with fully migratory vireos, so I had to look elsewhere for another. After some searching, I found a migratory population in the Florida Keys – and thus, unwittingly, set up a Byzantine labyrinth of permitting requirements for myself. The joys of completely illogical permit requirements: cleaning samples in the field. Multiple government agencies in three different countries, using two different languages: all the necessary ingredients for a Kafkaesque disaster. 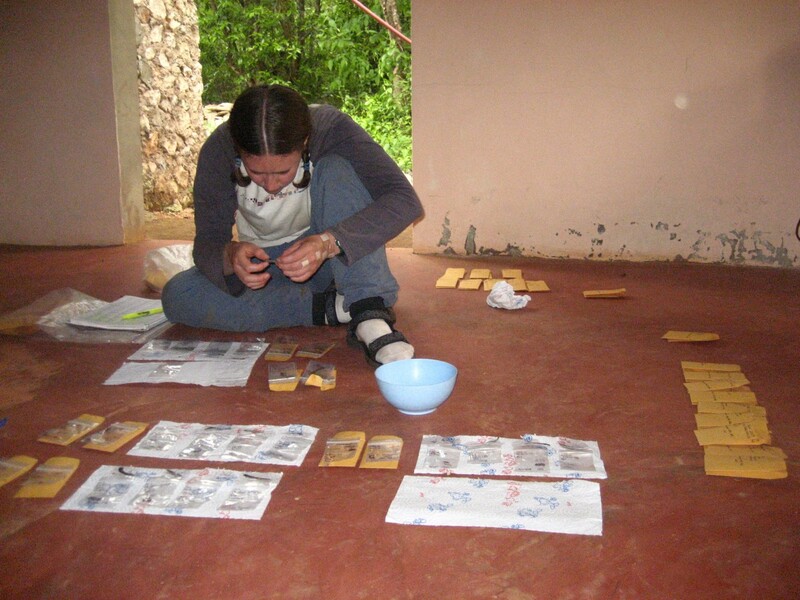 I spent hours on the phone, mostly on hold but occasionally insisting through clenched teeth that yes, I really did need someone to explain why, despite the fact that I held a U.S. master bird banding permit, I also needed to obtain a Canadian master banding permit to band birds in the Dominican Republic. Or trying not to yell while explaining for the fifth time that using chloroform to clean feather and claw samples while staying at a remote field camp with no lab facilities would be…challenging, to say the least. Finally, less than a day before I was scheduled to board a plane, all the permit issues were sorted, all the necessary equipment and various backups had arrived, and I was ready to go. But, as often happens (to me, at least), once I knew I was going to be able to go, I was suddenly no longer sure I wanted to. 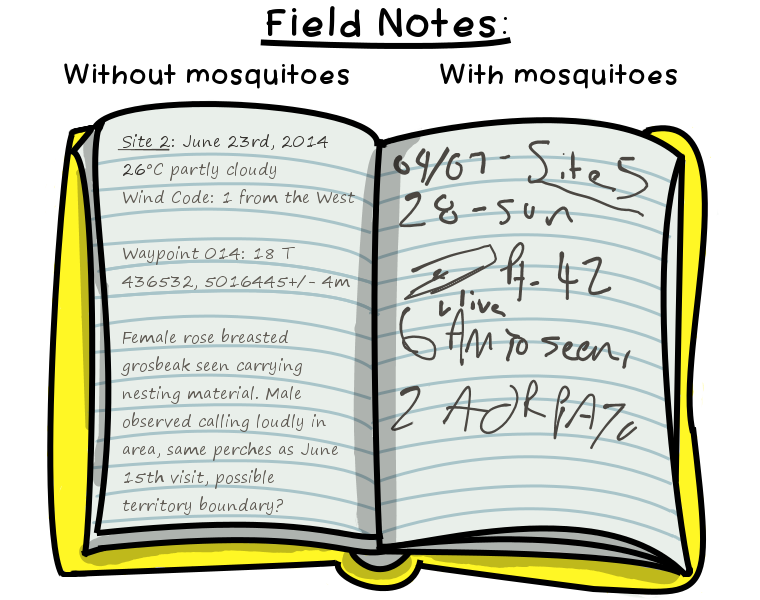 I was on edge for the entire journey, from the first flight (Toronto to Miami), through the second flight (Miami to Santo Domingo), to the long drive from Santo Domingo to the field site. I had wanted to try something different for my PhD fieldwork, but I was feeling seriously out of my element. The drive itself only added to my worries: the farther we travelled from the city, the more our surroundings (notably, the road itself) seemed to have fallen into disrepair. However, when the truck finally slowed to a halt outside the gates of Rabo de Gato, I knew it had been worth the battle to get there. As we stepped out into the warm, humid air, all I could see was vivid colour, and all I could hear was the calls of unseen birds seemingly everywhere. 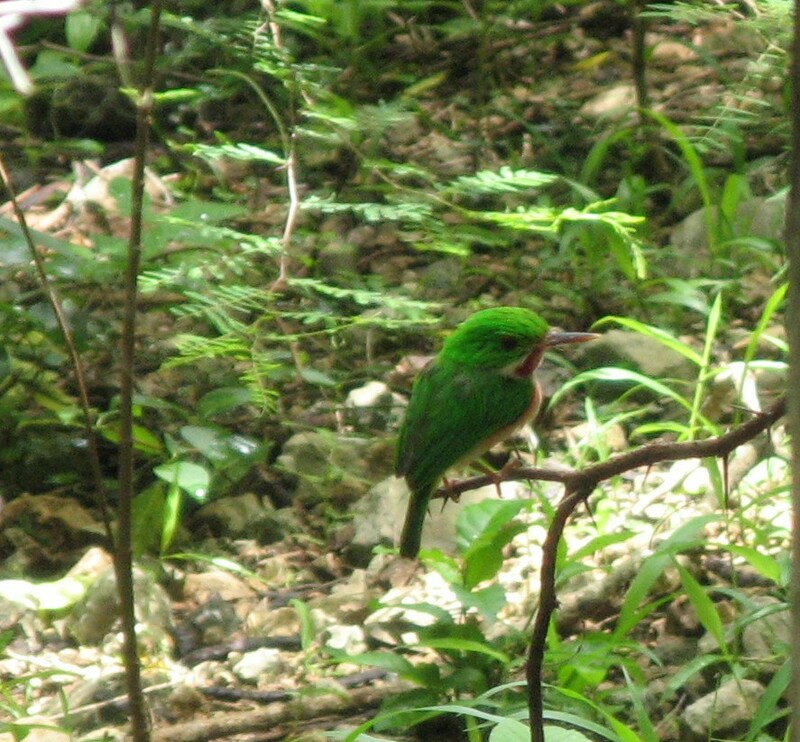 My new favourite bird: the broad billed tody. Perhaps the best part of the entire experience was the people I met. Despite the fact that my abysmal Spanish skills meant we could barely communicate, they nonetheless went out of their way to help me. For example, one of the biggest challenges we faced at Rabo de Gato was the constantly fluctuating electricity. Sometimes we had power, sometimes not – and there didn’t seem to be any pattern to it. 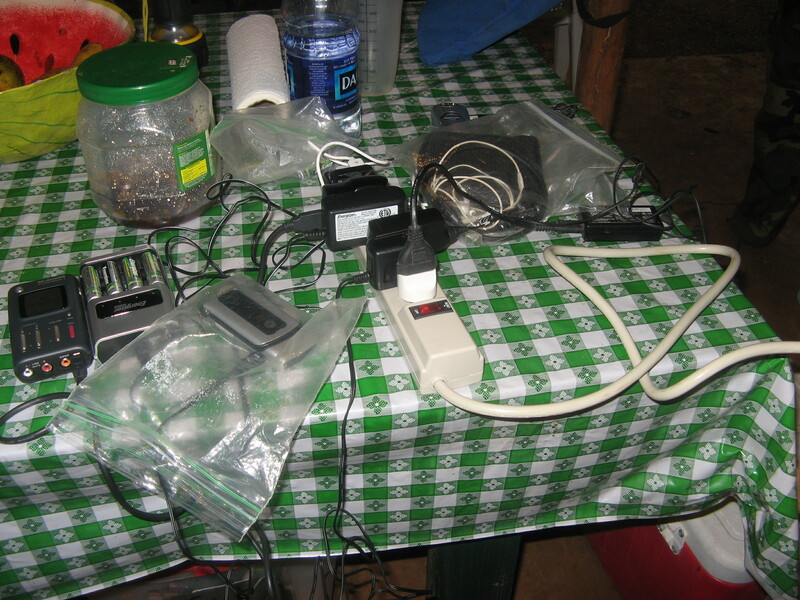 Unfortunately, virtually every piece of equipment I’d brought with me, from our digital sound recorder to our emergency cell phone, needed to be charged regularly. But with no way to predict when the electricity would come on, there was a good chance we’d be out in the field when it did, and miss the rare chance to plug in our myriad electronic devices. The camp caretaker took it upon himself to solve this problem for us. No matter where we were, if the electricity came on, he would come chasing after us, panting and calling out, “Luz! 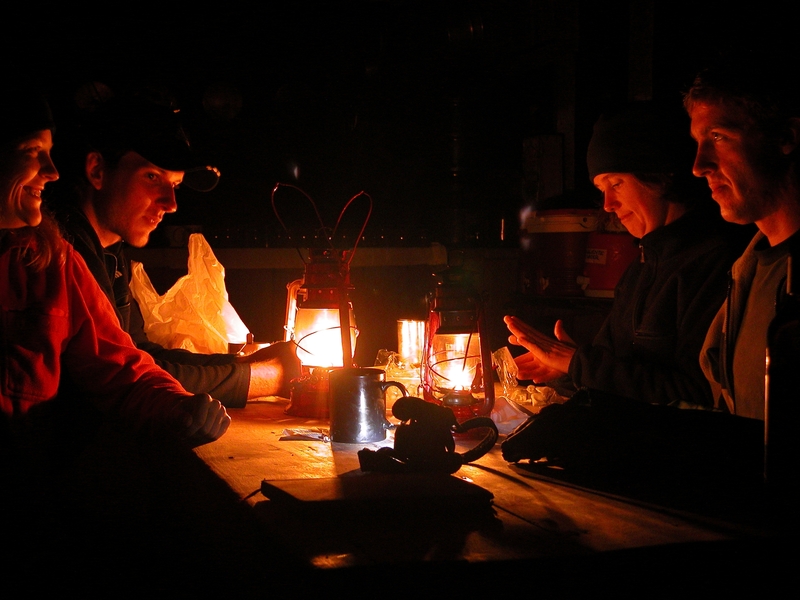 Tenemos luz!” – giving us the chance to rush back to camp and plug in everything we owned. At the end of my field season, I found it hard to leave the colour and light of Rabo de Gato – but I told myself that I’d be back. Imagine my disappointment when I discovered that, while the tropic were everything I’d hoped, the science hadn’t worked out the way I’d imagined. The birds had proved challenging to work with in a number of ways, but the biggest problem was my inability to tell migrants and residents apart. And so ultimately, my first field season in the tropics also ended up being my last. Does this mean I asked the wrong question? I’ve wondered that a lot over the last few years – but I still don’t think so, and not just because I got the opportunity to explore an amazing new ecosystem. I also learned one of the hardest lessons of my PhD. I took a risk on a study system that no one knew much about – and in my case, it didn’t pan out. But I think that it was worth trying, because taking risks is so often how science advances. Since so much science is done by students, if we don’t take risks, who will? We are excited to welcome the super-talented Liv Monck-Whipp to the blog today. Liv is the creator of Tails From the Field and write for us about how she uses humour to share her fieldwork stories. Make sure you check out her site – it’s hilarious! It was shortly after getting attacked by a Ruffed Grouse in Algonquin Park that I decided to start making comics about fieldwork. I had been making my way out of the woods after monitoring some thrush and warbler nests, and I accidentally strayed into a mamma grouse’s domain. She did not take kindly to this (I am a big scary predator lookin’ thing, or at least so I like to tell myself), and while her brood flew hither and thither, she flew straight at my eyes. Luckily I was able to brush her off before she did any serious damage, and she set about buzzing by my head, perching on my shoulder to flap into my face. She continued her assault until she decided a broken wing display was more effective, and I thankfully escaped with my life. True story. And my friends thought my dramatic re-enactment of this story was pretty hilarious. Much in the way so many of us gathered to guffaw around #fieldworkfail, stories of minor mishaps and equipment failing*, or weird study subject behaviour, if told with a dollop of humour, can be used to grab the attention and interest of non-fieldworkers and fieldworkers alike. And it’s not just the fails that amuse us. I know that you know that your field biology and/or naturalist friends have some of the cheesiest nature puns and jokes out there (and please send them all to me!). These are the product of true geekery – being so into your subject that you can’t help but inject it into everything with a grin. That harrowing grouse encounter was pretty early into my field days. My second season out there, and I was starting to appreciate how hilarious field work could be. From the surrealness of explaining to my relatives that I couldn’t visit unless it was raining, to waking up covered in slugs, there were a lot of funny-weird, and funny-ha-ha things. And I loved it. And I wanted to communicate about how awesome it was. I’m a web comic addict (often catching up on them once the field season is over!). So when I wanted to tell stories and in-jokes, I thought in comic-terms. Comics, if you think about it, are a really elegant way of delivering a story or idea in a short amount of time. They allow for the nuances of facial expressions, and the hyperbole of exaggerated figures to come through without using up text. The messages are usually quick, and humorous. For my first few field seasons I was an assistant for graduate students working on bird and turtle studies out of Algonquin Park. 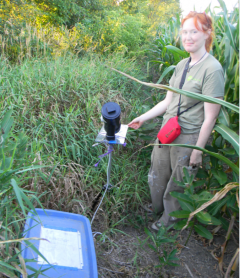 Then I decided I wanted to do my own graduate work, and began studying bats in farmland. Somewhere in there, I worked for a large land trust doing conservation work, and I also got to radio track snakes and turtles for another study. This actually left me with a lot of “thinky” time in the field: hiking or canoeing long distances, or quietly getting eaten alive by mosquitoes while waiting for a bird to return to its nest. In this time I started to come up with comics and jot them down in my notebook**. Positive feedback from friends and co-workers convinced me that there would be a niche (geddit, geddit?!) 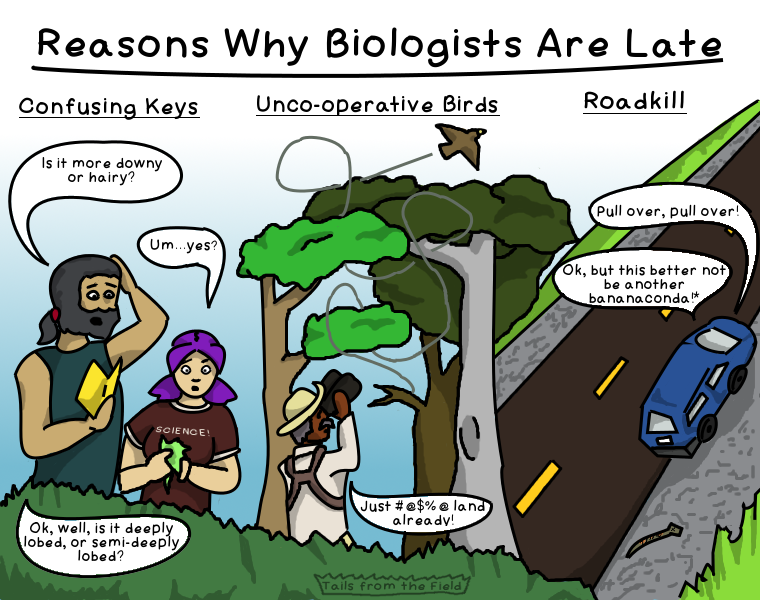 for field work and ecology themed comics. Laughter is a universal language. While I wanted to amuse others involved in field biology, I firmly believe that jokes and funny stories are some of the best ways to engage people about subjects you love, no matter their background. Humour can help to reduce the “stuffy scientist” image a bit, or lighten up an academic lecture. By sharing our sillier sides with each other and with the public we can gleefully spread our enthusiasm, and demonstrate just why fieldwork is so dang interesting. **Always have a notebook. Always. Liv just finished her MSc at Carleton on the influence of crop arrangement and composition on bats. She did her BSc in Zoology at the University of Guelph, and then took off into the woods for awhile to assist in studies investigating nest protection for turtles, road mitigation for reptiles, and the effects of logging techniques on birds and vegetation communities. She also enjoys contributing to citizen science projects and is the creator of Tails From the Field, a web comic about field biology and nature. 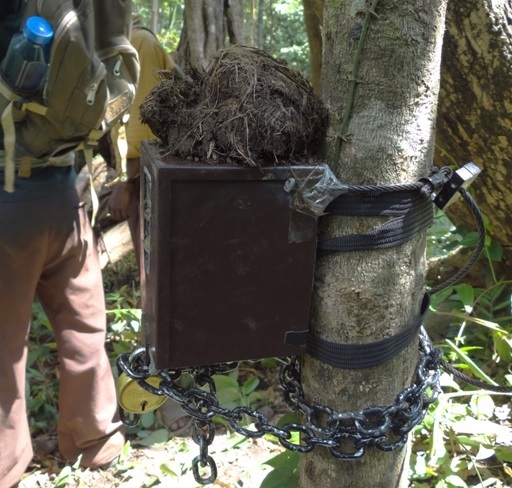 This week, Dispatches from the Field welcomes guest poster Aditya Gangadharan, who continues our exploration of fieldwork in remote places with some stories from his PhD work in India’s Shencottah Gap. As part of our ongoing collaboration with Wild Lens, Aditya also shared his experiences with Matthew Podolsky in an Eyes on Conservation podcast. 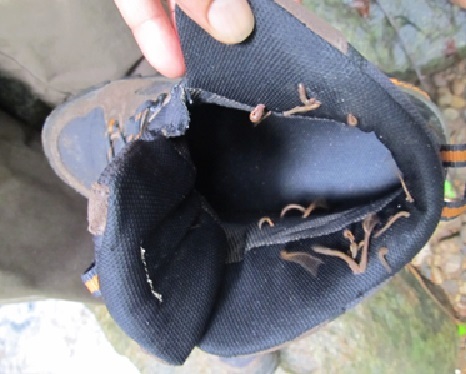 This is what your shoe looks like after a few minutes walk in the monsoon season. You might wonder what is so remote about a region where more than 300 people live per square kilometre on average. I mean, that’s more than twice the population density of a city like Edmonton, where I currently live. But such profound thoughts are far from your mind when you are trying to sneak down from your camp to the nearby stream for a bath after a hard day of fieldwork in the rainforest (also known to insiders as ‘death by a million leech bites’). 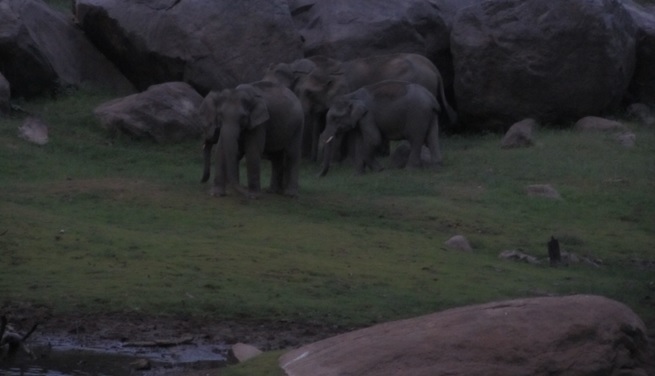 Elephants making their way down to the water in the evening. … and if (correction: when) they charge at you in the dark, the 200m to your camp may as well be 200km for all the help you will get! If you see this next to your face, you can safely conclude that you are in big trouble. 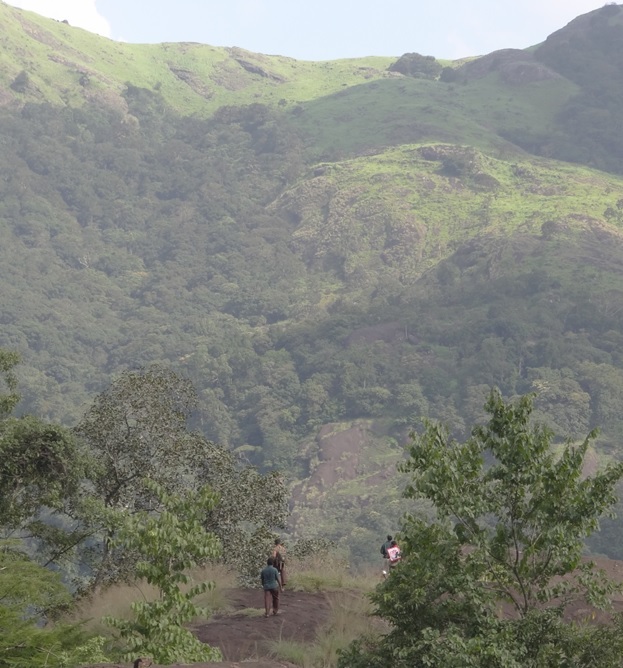 Such is fieldwork in the Western Ghats of India – one of the richest and most threatened biodiversity hotspots in the world. My PhD research was in the 400 sq. km Shencottah Gap, an economically-productive region that separates two reserves – and my goal was to identify corridors that could be restored, so that elephants and tigers could move between these reserves once again. A typical campsite – no fuss, nothing fancy required! Many of those remnant corridors are in the more rugged areas, because people tend to be concentrated into towns, villages and farmland in the flat, fertile valleys – and so, we follow the wildlife upwards! Of course that is easier said than done – there are few roads, so you have to walk to most places. 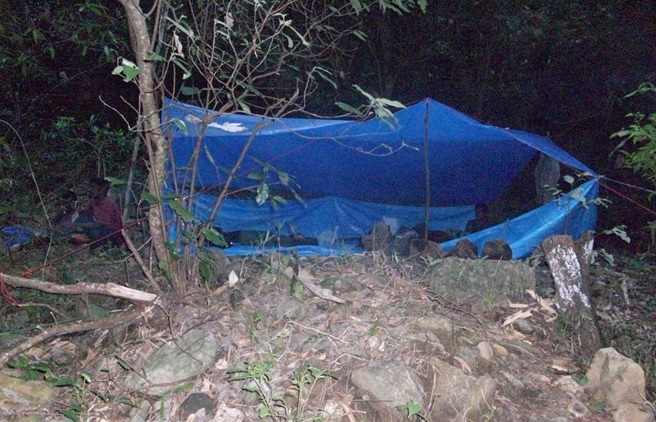 You often have to camp out to reach those places, which in our case simply involves putting one tarpaulin sheet on the ground, another on top, and keeping a fire going. But how do you find the animals? 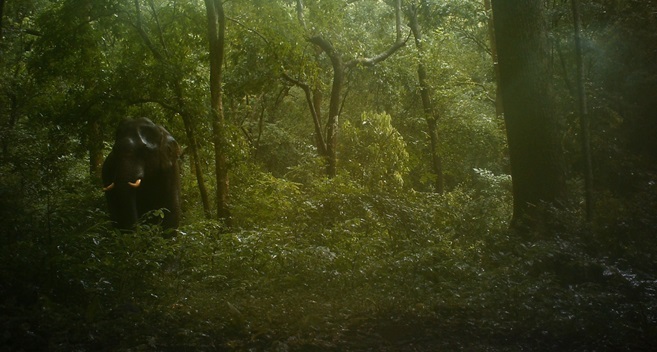 The vegetation is thick, so you rarely have any direct sightings – instead, you have to look for animal signs (like tracks and dung), or set up camera traps that automatically take a picture when an animal passes by. Normal people do this fieldwork only during the 6-9 months of the year when it is not raining. Less normal people such as myself are often in the field during the entire year, including the monsoon! Carrying out visual and sign-based surveys for large mammals. Setting up a camera trap. Now, in the photo above, you probably noticed that the camera is encased in a very solid metal case, and secured by a heavy chain (no wonder my back hurts!). 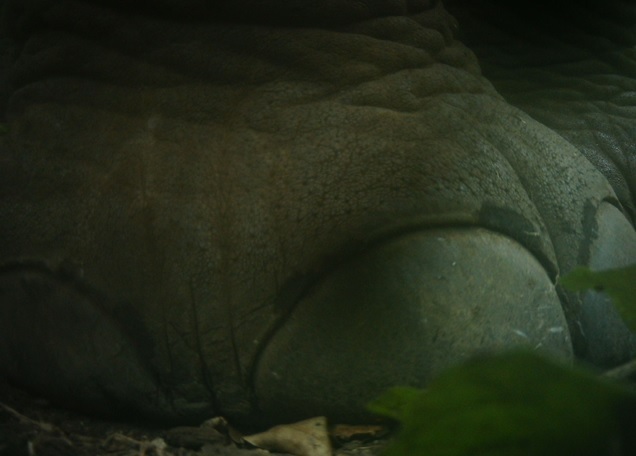 You might also be wondering: why is there elephant dung on top of the camera? 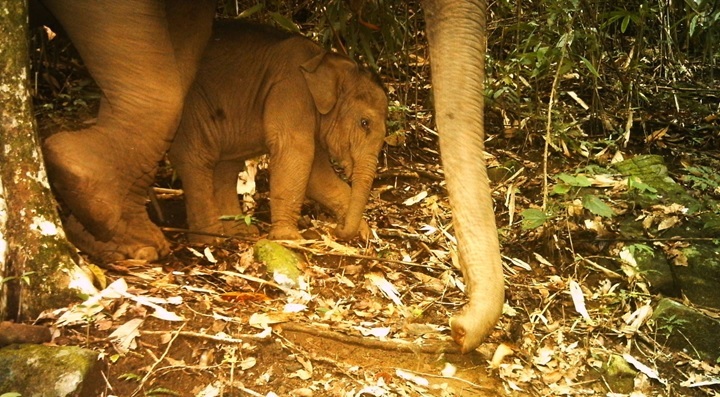 Well, elephants like to destroy cameras. And it is not fun to toil up a rugged mountain, place a camera there, go back after 3 weeks, and see that your camera was smashed on the same day you deployed it. So I had this brilliant and cunning idea that if I smeared the camera cases with dung, elephants might treat them with more kindness. The results I got were spectacularly useless: elephants are intelligent animals, and they are not going to be fooled by such a simple plan. The only tangible result of my experiment was my backpack smelling of dung for many weeks. 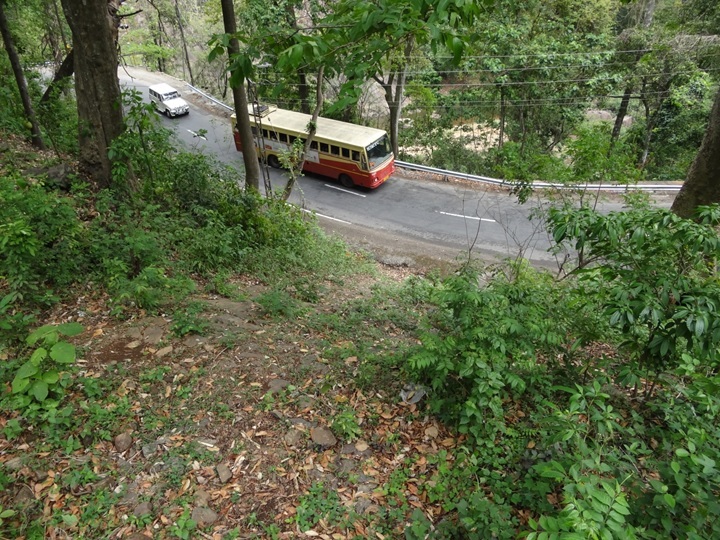 Turn back here: this steep descent and busy highway were impossible for elephants to cross. And so, that’s where we are at today: it is demonstrably possible to restore these corridors in the Shencottah Gap. But actually implementing this restoration is a huge task – one that will likely take many years, and has to be led by the government. Luckily, there are positive signs from the government so far. One day, I hope this little guy will be able to migrate across the Shencottah Gap as his ancestors once did. Aditya Gangadharan works on conserving biodiversity in fragmented landscapes that are subject to multiple uses by humans. 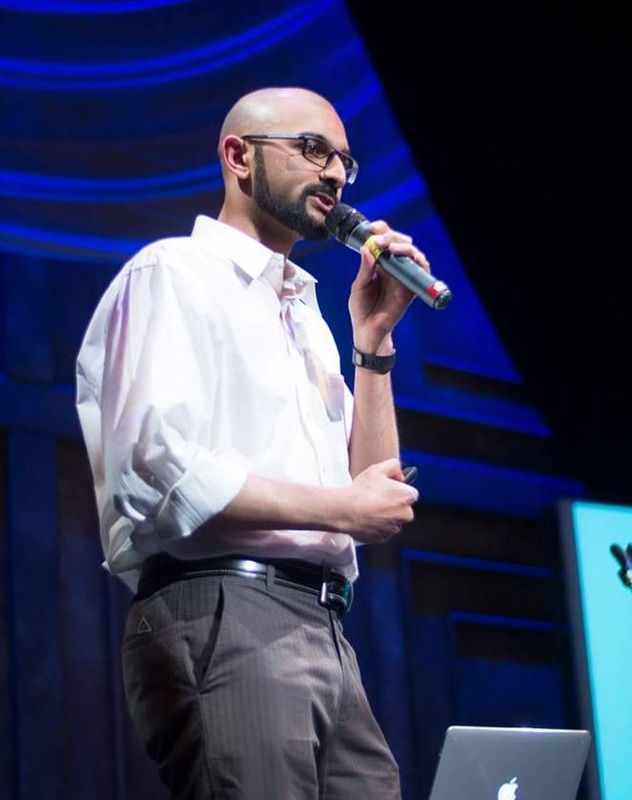 He focuses on converting technical research into actionable policy recommendations, and communicating these to managers and the general public. He blogs about elephants, tigers and frogmouths at http://adityagangadharan.com.